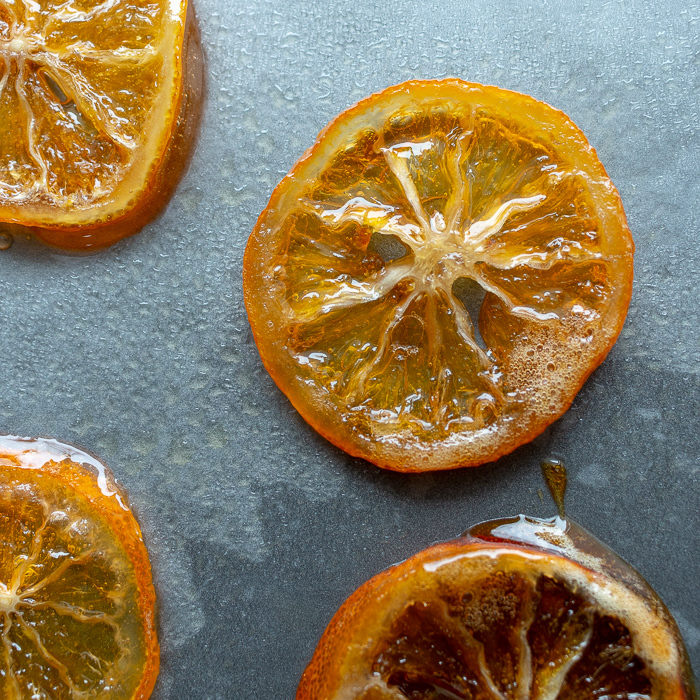 Honey Candied Meyer Lemon Slices look like beautiful stained-glass windows. They are little bit chewy and a little bit crunchy and oh so addictive. We used all-natural raw honey and just a little bit of Meyer lemon juice to make these delicious treats. 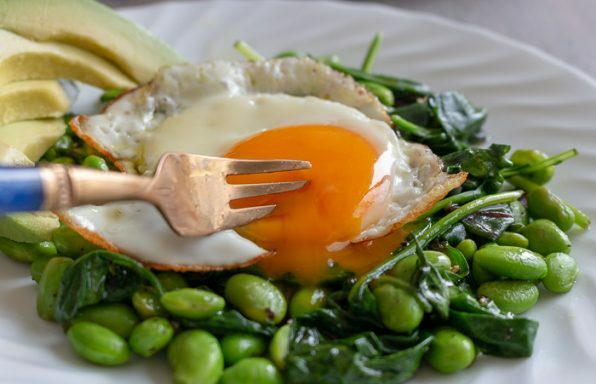 You can use regular lemons too in this recipe and it is just as delicious. 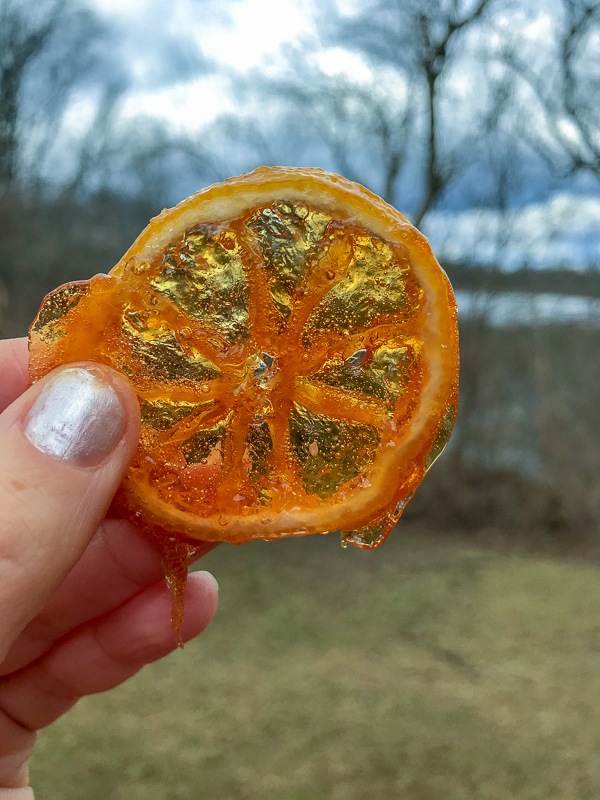 We have tested both and the Meyer Lemons that are a little sweeter and have a little bit more of a mandarin orange taste. However, regular lemons are just as lovely. Regular lemons have that fabulous sour note along with the sweet and it really is a favorite with our boys that love sweet and sour candies. Don’t Throw away your Lemon Honey Glaze! This recipe is like getting two delicious recipes in one. You are going to make delicious Honey Candied Meyer Lemon Slices and you are going to have a delicious Honey lemon glaze that can be used in a million ways. 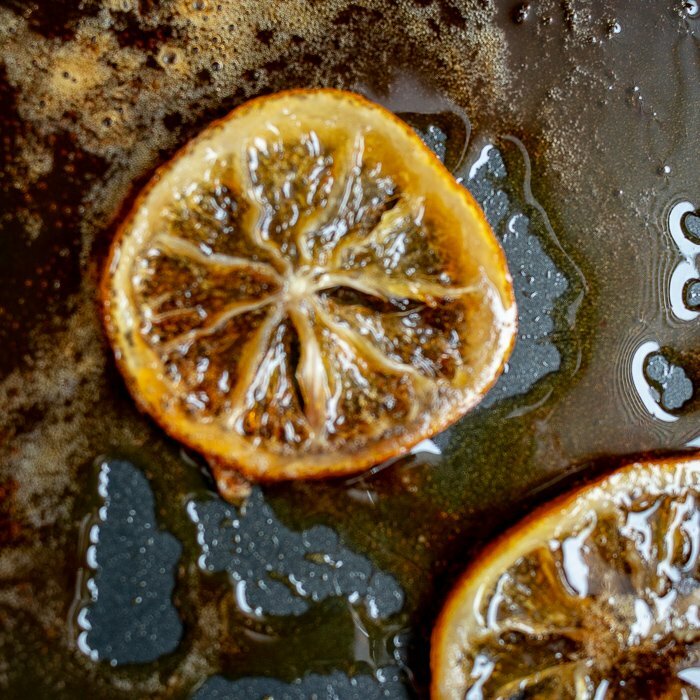 The leftover honey lemon glaze that is left in the pan after cooking your lemon slices is like liquid gold! Honey lemon glaze can be used to sweeten teas, cocktails, desserts and much more. 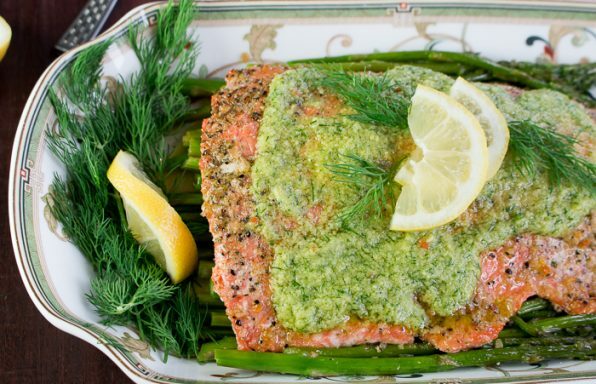 If your throw in a few culinary lavender sprigs during the last part of the cooking process, you can have an amazing Lavender Lemon Honey Glaze. How delicious is that! You are so going to want to do that as we have a spectacular recipe coming your way that uses this very ingredient. 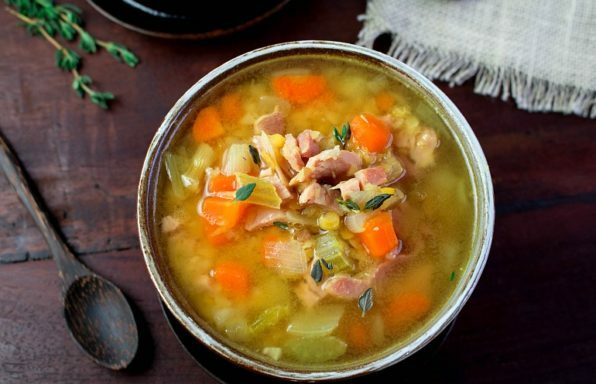 Book mark and PIN it to your recipe boards. Be sure to check out our Icebox Lavender Lemon Angel Food Cake. We used our delicious candied Meyer lemons to garnish this showstopper spring cake (takes less than 30 minutes to make). In addition, we used the reserved honey lemon glaze to sweeten the coconut whipping cream. Unlike the traditional way of boiling the lemon slices first, we had the complete process done in less than 15 minutes. Really!!! It really can’t get any simpler than this. Actually, you don’t even need a recipe as it has only 3 ingredients; Meyer lemon slices, honey and a little bit of Meyer lemon juice. That’s it. We know the usual recipe calls for simmering over a low heat for about an hour to make a thick syrup candy. However, we cooked our Honey Candied Meyer Lemon Slices bubbly over medium heat. We cooked it until about ½ the honey and lemon juice had reduced, and the rinds were tender. The total cooking time was around 12-14 minutes. 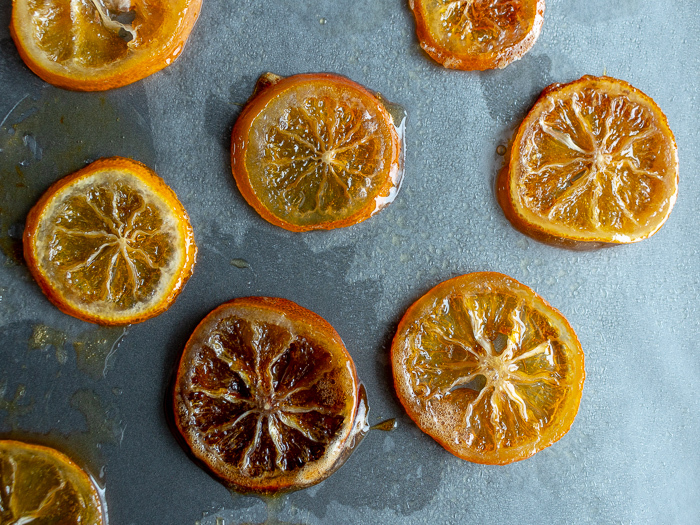 The candied lemons will stay chewy even when dried. In addition, we did not use a whole cup of processed sugar like in other recipes. Instead, we used about ½ cup raw honey. Did you know there are about 774 calories in 1 cup of granulated sugar? However, there are about 515 calories in a 1/2 cup of Honey. Honey has a lower GI value than sugar. It does not raise blood sugar levels as quickly. In addition, honey is sweeter than sugar, so you can use less of it. 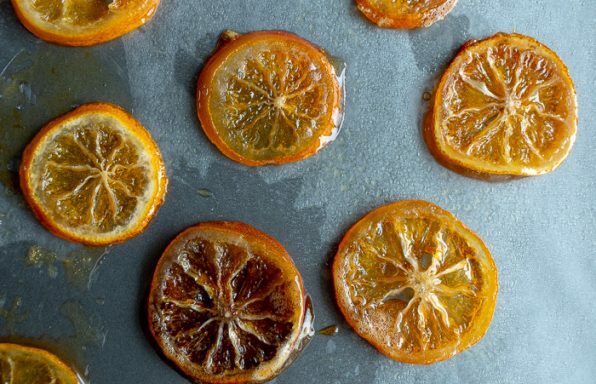 Honey, unlike using refined granulated sugar leaves the candied lemons with a sticky and slightly chewy texture. They will not get hard and crunchy. 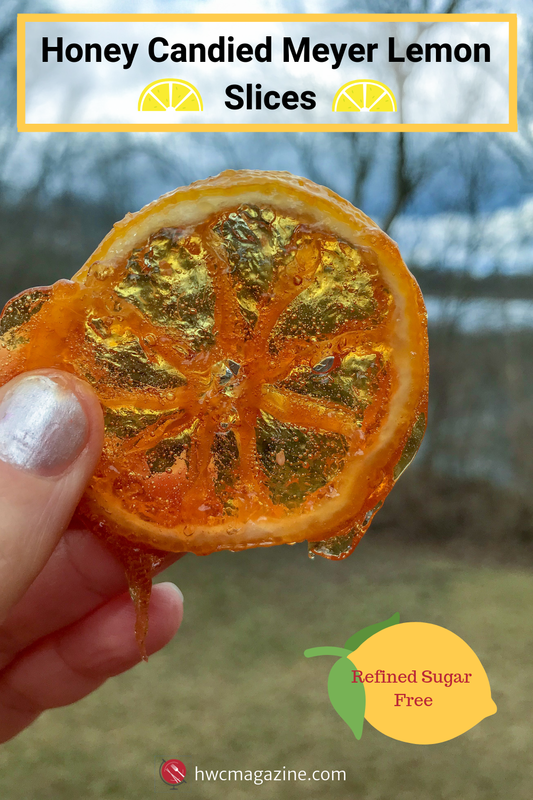 You can dry your Honey Candied Meyer Lemon Slices either on an oiled wire rack or oil sprayed waxed paper lined baking sheet. We have found that if you choose to use a baking sheet lined with waxed (parchment) paper, it is best to use a little spray oil as well. Once the honey has cooked and cooled it forms into a semi hard candy and it sticks to everything. It is VERY important that you once you are done cooking, you immediately get all your pans and utensils you used rinsed or soaking. You can thank us later… LOL You can store the candied lemon slices in the refrigerator in a sealed container for a week. However, they will not last that long. It was a nightmare patrolling the family from eating all of them before we were able to get a few photos. What’s the difference between a Meyer Lemon and a Regular Lemon? 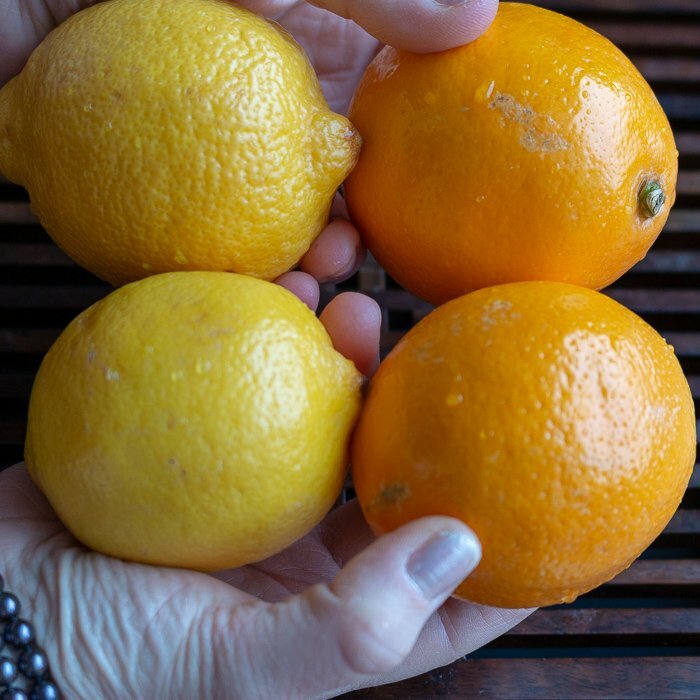 Meyer lemons are a little smaller in size compared to a regular lemon. In addition, a Meyer lemon is a little sweeter compared to a regular lemon as they taste cross between a mandarin orange and a lemon. Also, Meyer lemons have more of an orange skin compared to a lemon. Meyer lemons are only available around late December to May, so they are in season right now. However, you can find regular lemons all year around. 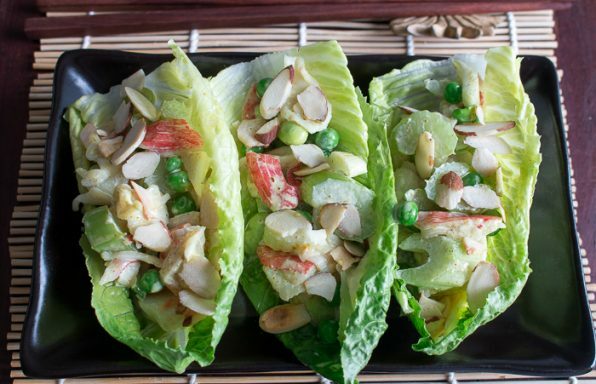 Even though it snowed today, we are thinking spring and have many light and bright recipes coming your way. Stay tuned. 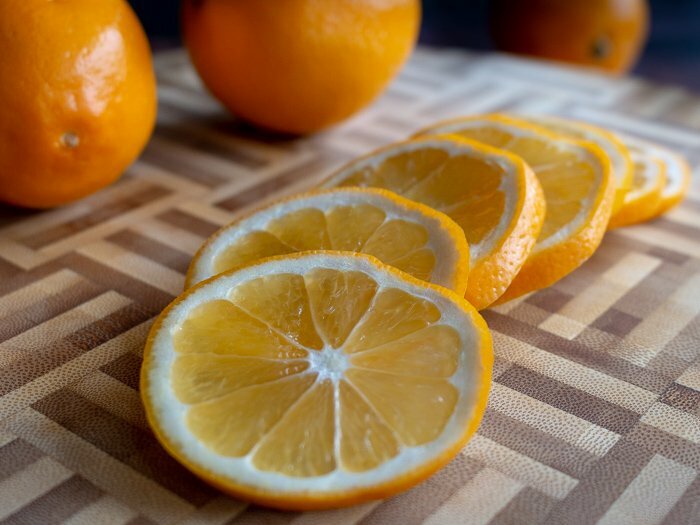 Meyer Lemons (or Regular lemons) – 2 lemons sliced thinly about ¼ inch. 1Add honey and juice from a lemon to a frying pan. Stir. Add slices of Meyer lemons or regular lemons and cook over medium heat. The honey mixture will bubble. Turn the lemon slices over a few times during the cooking process. 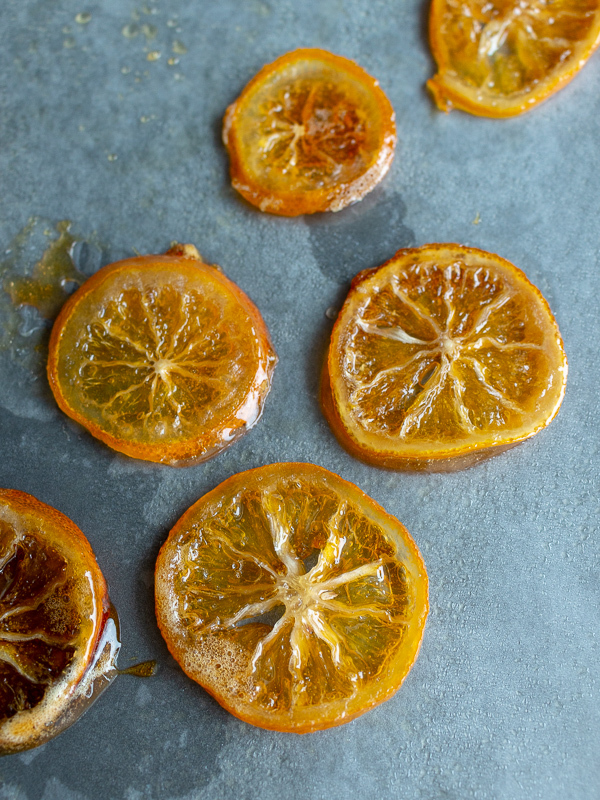 2The Honey Candied Meyer Lemon Slices are done when the peel is tender, and the honey glaze mixture has reduced to ½. The glaze will become golden. Cook time is from 12-14 minutes. 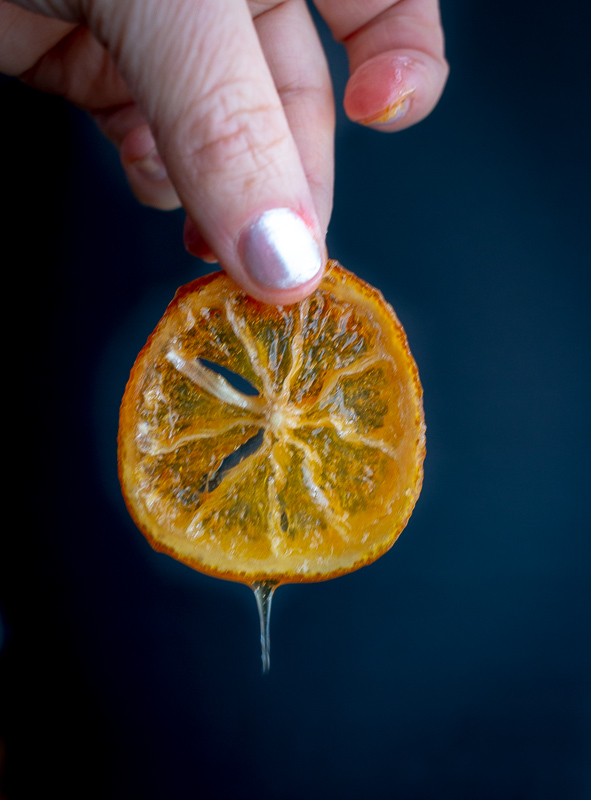 3Cool and dry your Honey Candied Meyer Lemon slices on a greased wire rack or a waxed paper lined baking sheet that has been greased first. DO NOT THROW AWAY the honey glaze. 4If you wish to make our delicious NO FUSS super easy Lazy Lavender Lemon Cake, add a few springs of fresh culinary lavender to the pan and a couple of drops of water and let it sauté for about 5 minutes or until aromatic. Remove from heat and transfer to sealable container for storage. 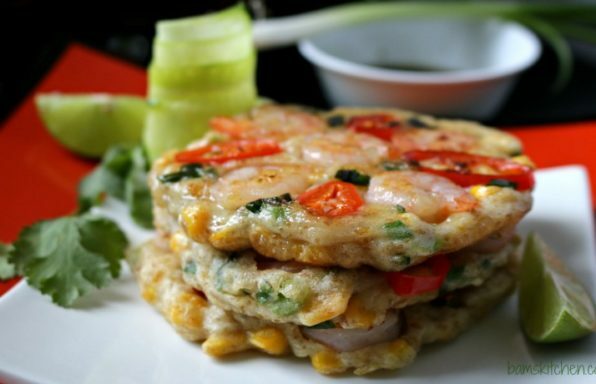 Allow to cool completely before covering and putting it in the refrigerator. (This Lemon Lavender Honey glaze is like liquid gold. Fabulous to add to teas, desserts, cocktails and the list goes on. 5Then, immediately rinse off your pan and all of your utensils you used during the cooking process. Don’t wait! Remember, you are making candy so that cooked honey will harden on your surfaces making it difficult to clean later. At least get them soaking. You can thank us later. Enjoy!